Following the sad passing of Ajax & Barcelona legend Johan Cruyff I'm sure I am not alone in enjoying a Cruyff-inspired Ajax save. 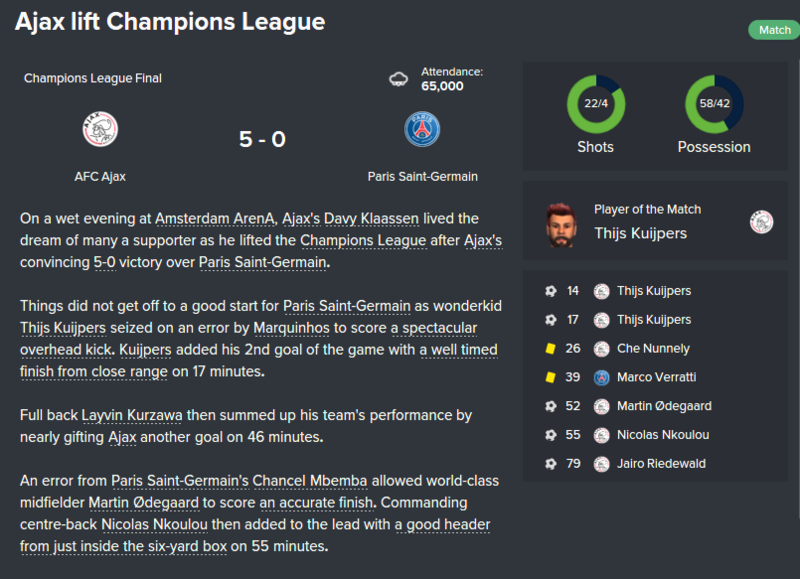 I always enjoy a save with Ajax. Developing the club's youngsters and creating a formidable team of home-grown talent. At the outset of this game, I actually intended to move towards the classic Dutch 4-3-3 - which I did actually play briefly - however the lack of inside forwards and abundance of wonderful central midfielders, ball playing defenders and wingers meant a Johan Cruyff's legendary 3-4-3 diamond was actually a better option. After much experimentation I have found a system which I am happy with and has brought great success, perhaps some may be interested and we may prompt some interesting discussion. *Not that FM isn't real life.. According to Spielverlagerung's excellent analysis, this is the shape we are trying to create. Formation, shape and mentality go hand-in-hand as the backbone of your tactic. I don't think there's much sense talking about one without the others so I'll cover them all at once. 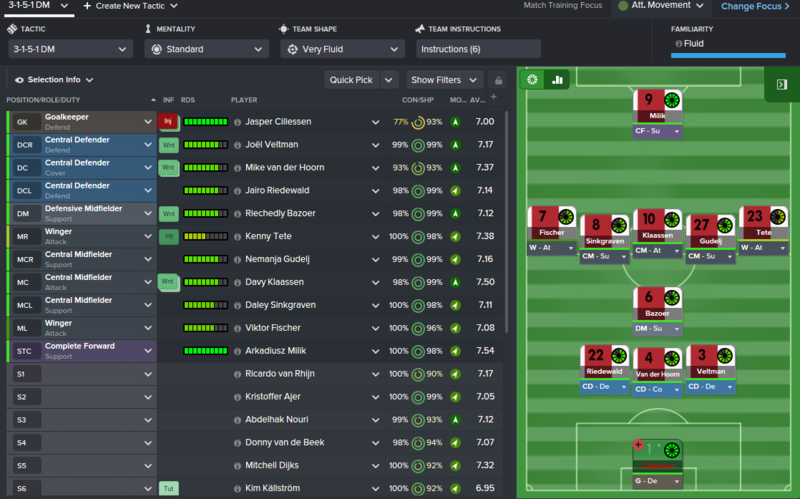 As you're probably aware by now, in Football Manager your formation refers to your defensive shape. So after a much experimentation, I settled on a 3-5-1-1 shape. Very Fluid: For me, the description below describes word-for-word exactly what we're looking for here. Complete footballers, attacking and defending as a team in a fluid shape playing free-flowing football with high creative freedom. Perfect. Standard: Balance is the key word here. The temptation here would be to select control, or attacking. The reason I went for Standard is that playing a Very Fluid shape means that my team will attack and defend as a unit. This means that selecting a more aggressive mentality would make my entire team more aggressive. In other shapes, such as rigid or balanced, this is balanced out by reducing the defenders mentality but not in Very Fluid shapes. In my experience, Very Fluid shape does not mix well with Attacking mentality. I am sure it could work but in my experience it is simply not balanced. My team consists of intelligent, technically talented players and my instructions give them good movement, passing options and creative freedom. I want to allow these players to pick the best option, rather than the one closest to them. Much of the time the best option will be a short pass, but occasionally they could rip open a defence from range, if it's on. I don't think Cruyff would say 'no' to that! Want to avoid possession for possession sake. We want to dominate possession but also make sure we're creating chances and moving forward. *by 'player specific' I mean that I alter the instructions based on the strengths or weaknesses of a particular player. Using the starting XI above as an example, Klaassen is a great, aggressive central midfielder so I have him Get forward, close down more, dribble more and play more direct passes, whilst Van de Beek on the left is more of a patient passer, so I have him hold position, pass shorter and fewer risky passes. I try to balance the two so one more aggressive and the other sits helps recycle possession. The screenshot below comes from the Home Leg of our 2020 Champions League Quarter Final tie with an aging Barcelona side. Ajax are in possession of the ball in midfield with Bazoer playing a short pass towards Klaassen. Here, you can clearly see a wide back 3 with a diamond midfield ahead of them and a centre forward, flanked by two wingers. You can also see the problems this shape is causing for a deep 4-2DM-3-1. Look at the space our our midfielders have. We won this game 4-1 and achieved almost 60% possession. If heat maps are more your thing, here is our Average Position with the ball. 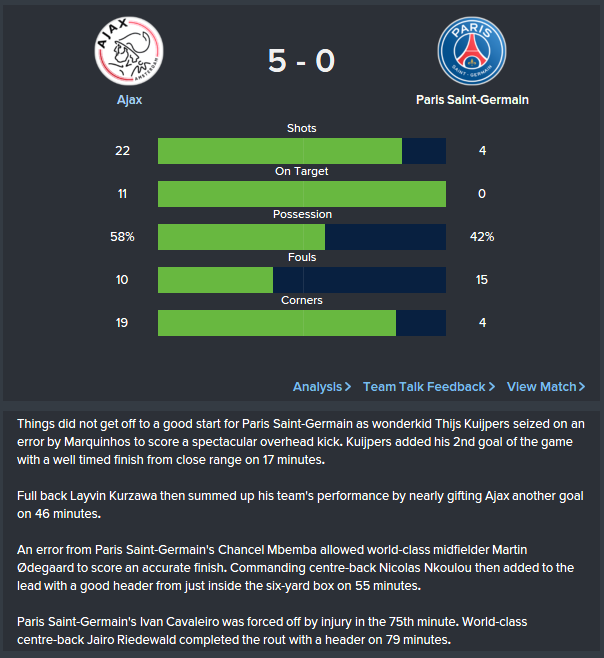 We faced up against Laurent Blanc's PSG side. It was the collision of two very different footballing philosophies. PSG has spend more than £560m since the game began, whilst 7 of the Ajax starting 11 come from the Toekomst academy. 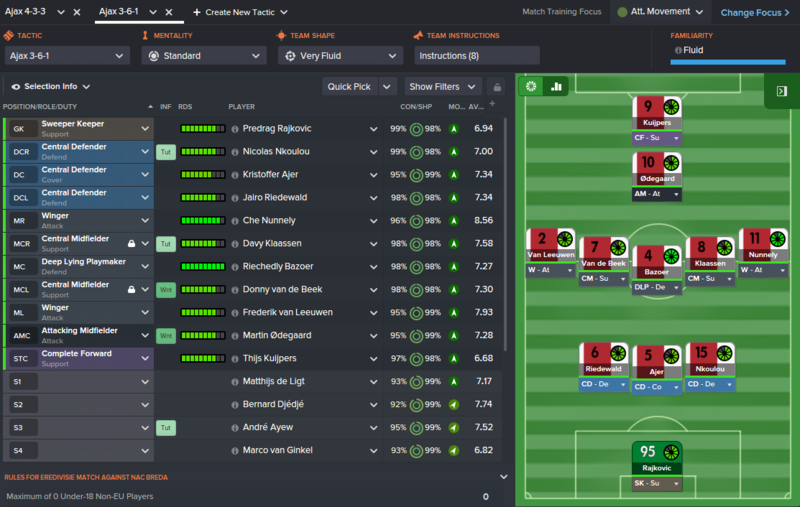 PSG lined up in a formidable looking 4-3-3 and I played the system exactly as outlined above, no special tweaks. The main reason for choosing to play a 3-6-1 system is it's strength off the ball. The numbers in midfield mean you can press aggressively without worrying about leaving gaps. Here you see PSG in possession at the back and you can immediately see how much pressure they're under. Mbemba narrowly managed to get the ball away to his fullback before my centre forward pounced on him. Now look at the options open to the fullback. Nada. My left winger is up and on him before the ball lands at his feet. You need a formation where your player will be close to the opposition player with ball, i.e no gaps in formation, for example it's difficult to press opposition fullbacks with a 4-4-2 diamond as you have no width. You need to support that player by covering the gap he leaves, and cutting off passing options, i.e 5-man midfield offers great cover (see article above), and tight marking. Wining the ball instantly with a high press is great, but difficult. The real objective of the high press is to force the opposition into a long ball, when we have 3 mobile defenders and a holding midfielder. Now you can see our defensive structure when PSG have possession in a threatening position in the attacking third. In the absence of Fullbacks, players in the MR/ML strata drop deep and defend as slightly advanced fullbacks creating a very solid back 5-3-2 shape. Bazoer will drop into the defence if anyone is out of position to kill any gaps. This is the premise of my defensive structure. One of the things I like about generalist roles vs specialist is their defensive work-rate. Look at #10 - that's Odegaard, my attacking midfielder still getting tight on Daley Blind, cutting off any passing option there. As you expect from a Total Football-inspired team who attack and defend as a unit, our defenders and indeed goalkeeper are the first stage of our build up play. Very Fluid - More movement, creative freedom and defenders encouraged to get involved with play. Standard Mentality - players pick the best passing option, unbiased as to whether it is a short or direct option. Generalist roles - with the exception of the DLP, players will not be biased towards finding a 'playmaker', again simply choose the best option. This image shows that our formation is essentially two diamonds, with a front 3 ahead of them. 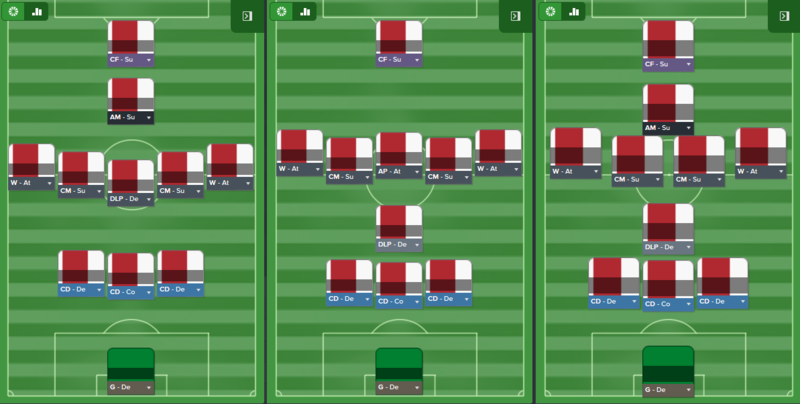 Almost all opposition formations will find it difficult / impossible to put pressure on each point in both the diamonds, so you'll almost always have a 'free player' in the build up phase. This is an easy example, as PSG are not pressing at all. You may notice I have Bazoer highlighted in a lot of the highlights. The reason for this is that he is my point of reference. Bazoer is the pivot between the two diamonds and always needs to be available for a pass. The reason for having him highlighted is to see instantly if he is being marked out of the game. Bazoer will regularly drop into the back 3 to pick up the ball and distribute forward to my midfielders, wingers or attackers. Playmaker - only playmaker in the team, so he attracts the ball more and has the most passing options. Very Fluid - finds space himself and team mates offer good movement. In addition, higher creative freedom. When the ball is behind him, he has his back to goal, finding space for a simple pass and then playing another simple pass to an onrushing midfielder. When the ball is ahead of him, making forward runs and acting as a playmaker or secondary striker. NOT Roam from Position - none of my midfield diamond roam from position, as if they roam too much then I lose my diamond. SOMETIMES Swap position with ST, if your ST is a playmaker. Bazoer's positioning in the centre circle - I want him staying in/around here as a passing option and foil for opposition counters. Odegaard has his back to goal, open to play a connecting pass to an on-rushing midfielder before making an attacking run himself. <- we score a lot of goals from this. Back 3 spread wide in possession of the ball, all in plenty of space. Midfield diamond in an advanced position, ready to transition to attack. Wingers are wide, stretching the defence. 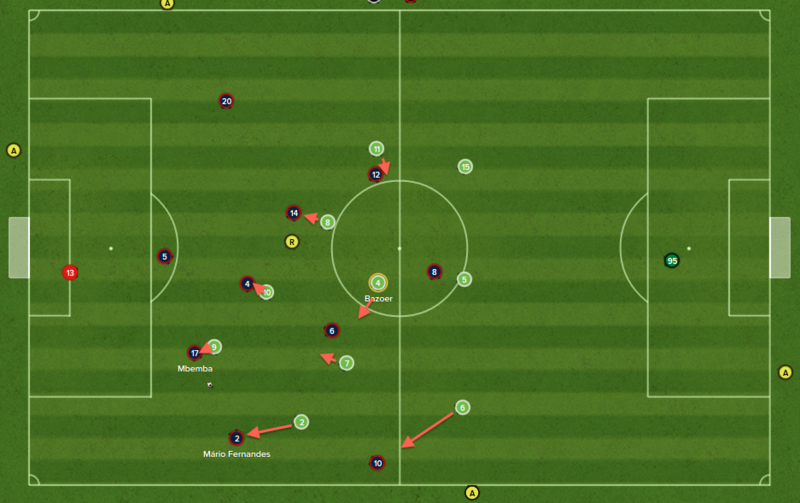 Complete Forward is dropping deeper, adding an extra passing option and creating space. Our shape becomes a 3-3-4. Odegaard is now facing goal, making an attacking run and creating a 2v1 on the opposition centre back. Our back 3 and midfield 3 remain reasonably in-tact, acting as cover to counter attacks and passing options. At times, Klaassen will make a later run into the box. Wingers make attacking runs into the box. I really like the positional play from MR/ML Wingers in a Very Fluid system. They allow us to transition from 5-3-2 without the ball in our half, to 3-3-4 with the ball in attack. We won the match comfortably and this was perhaps the defining match of this Ajax team. We destroyed PSG 5-0, recording 58% possession and preventing a single shot on target whilst a youngster from the academy was Man of the Match and scored a bicycle kick. This side also won the Eredivise, unbeaten and scoring a record number of goals. Odegaard, Nunnely, van Leeuwen and Patrascu all managed >20 goals in all competitions. Nouri, Ayew and Klaassen all achieved goal tallies in the double figures. If you're interested in the background & development of this team, I have been posting regular updates in the Ajax - de Godenzonen thread in the Player & Team Guide of this forum. Playing this style of football is not an easy task. Very Fluid systems give players more freedom than any other shape so it is essential that you use the right players. Very Fluid also encourages your defenders to play with the ball and your attackers to lead the defence. The concept of the complete footballer is central to Total Football. Klaassen is a great example of a Complete Footballer. Klaasen is my captain, an Ajax Legend and generally first name on the sheet when it comes to the big matches. Interestingly, there are now players in the squad with a higher level of current ability than him now, however they fail to match his contribution to the game. Looking at his attributes, he is the personification of this style of play and exactly what I want from a captain. Season 1 - Assign a tutor with high Determination and a positive personality such as Professional, Perfectionist, Resolute etc. and assign a broad individual training program whilst in U19 squad. 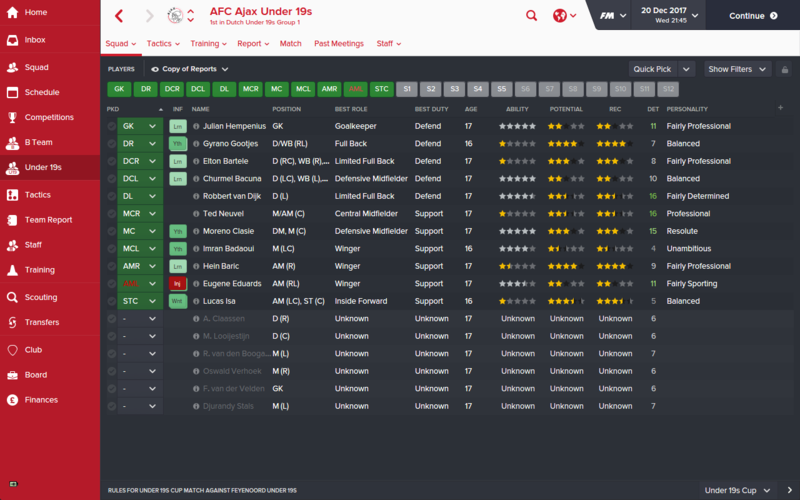 Season 2 - Progress to Jong Ajax or loan to gain playing experience and continue individual training. Season 3 - A) Progress to First Team squad for backup, cup matches and easier league games - teach PPMs and address any weaknesses. B) send out on loan for experience, C) Sell. At this point, you have a player with a good personality and 2-3 years of individual training in their best position. You can generally see if they are going to be of interest to the first team at this stage. Choose individual training programs which effect a wide range of attributes. I generally use Ball Playing Defender, Deep-Lying Playmaker, Roaming Playmaker, Complete Wing-Back, and Complete Forward. Despite not using these roles on the field, the end product of these training programs is a well-rounded player. I believe SFraser actually talked about this a number of years ago - Guide to Developing Youngsters. The most important aspect of youth development is to actively develop those who have potential, and to lose those who don't. There is no benefit of keeping players in the U19s to "see what happens". If they don't have potential, don't have good tutoring and don't get game time then 99% of the time, they won't develop. More concerning is that if they do have potential, but don't have a good tutor or get game time then it is also more unlikely they will develop - in this case you have just wasted a potential star. The point I am trying to make is that if they do have potential (even if it's not huge), get them a tutor and give them game time. Get the best out of them. Worst case you send up selling. Make sure every young player has a tutor (unless already determined with a good personality). Make sure every young player gets gametime, at the appropriate level. 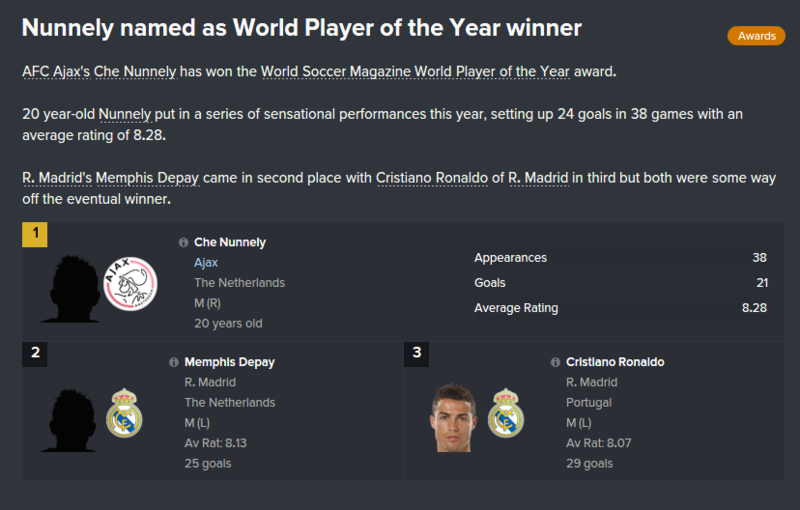 Aside from fielding 7 academy players in our starting team for the 2020 Champions League Final, Che Nennely has been the first superstar to come through this system. At the start of the game, Che is 16 years old in his first season with the U-19s. After being tutored by Ivica Olic and spending a year in the U-19s followed by a year with Jong Ajax, Che joined the first team and at 19 years old won European Golden Boy. The following year, he backed that up with World Player of the Year, becoming a Holland regular and adding a Champions League title in the process. Love it. Especially when SFraser is mentioned. I have been trying to recreate this tactic for the past few years on FM. I have copied your tactic and it works great. However, I have made a tweak to mine which I think works really well. I dropped the DLP(D) back to the DM strata. I think dropped the AM(A) back to the CM strata (making him an AP(A) (between the two CM(S) players) and finally, I moved the CF(S) back to the AM strata and also made him an AP(A). I found that playing strikerless results in some great 'false nine-ish' attacking play. I also found that I was being exposed in the defensive midfield zone a lot, so moving a player back here helps protect the defence a lot more. I wanted to add: What you wrote about Roaming (and not telling any of your midfielders to roam) is so spot-on and is something often not understood in most tactics. The midfield diamond is strength and unity. Why would I want my players to roam out of position and break this diamond? LOVE this, probably my holy grail for football manager and great to see it done so thoughtfully! One question I have is do you feel its necessary to include "be more expressive" on top of a very fluid shape? Do you think this shape could work with the current Arsenal side and if so how would you set it up. From what I can see it would mean that bellerin and Monreal would be sacrifice. Would be keen to hear your thoughts. Good work by the way? Thank you for the kind comments everyone. I am happy to hear people are enjoying reading! Despite a significantly lower quality squad we actually over-performed hugely that season, largely due to being excellent off-the-ball. I did move away from this due to losing a few key players that summer meaning I didn't have the right players, and took 1-2 seasons to rebuild. The reason I changed to 3-5-1-1 was that this allows a more compact defensive shape, illustrated below. Also, in my 3-1-5-1 my striker was isolated at times but I shouldn't imagine that's an issue for you, playing without a striker! As an Arsenal fan, it has certainly crossed my mind! My current conclusion is that it could work, after a season or two of clever transfers, but not with the starting squad. To begin with, we don't have a left-sided centre back and neither Mertesacker or Koscielny offer much with the ball at their feet. You'd also need a holding midfielder, and a left-sided central midfielder at least until Jack Wilshere returns to fitness. For me, Bellerin would be an excellent option on the right flank. As a general rule, wing backs are more complete players than wingers. I'd more likely cash in on Theo and let Ox and Bellerin fight it out on the right. Up front, Ozil and Sanchez could be perfect. Not 100% sure what I'd do with Cazorla. Arsenal's squad is a frustrating mis-match at the moment. Great thread! Saw this in the Ajax thread. Tried it with Malmö FF (just to see what it looked like) and I reallty liked what i saw. Some amazing attacking football and that with a team far from fluid with the system. Love threads like this. A fantastic thread, great to see other people writing about the Ajax way in great detail. It makes me miss the stuff I wrote for FM14 and makes me want to play as them again! Easily my favorite thread this year by far, great work mate. I agree. This is excellent thread. Top stuff! For me, this is exactly how a tactical thread should be. Team Shape is something I just can't get my head round, I've read and re-read L&D but just can't grasp it. By selecting Very Fluid will you defenders not try something spectacular with the high level of improvisation that setting brings? Cheers, Cleon. Really appreciate your feedback as I've enjoyed your work for a number of years now. 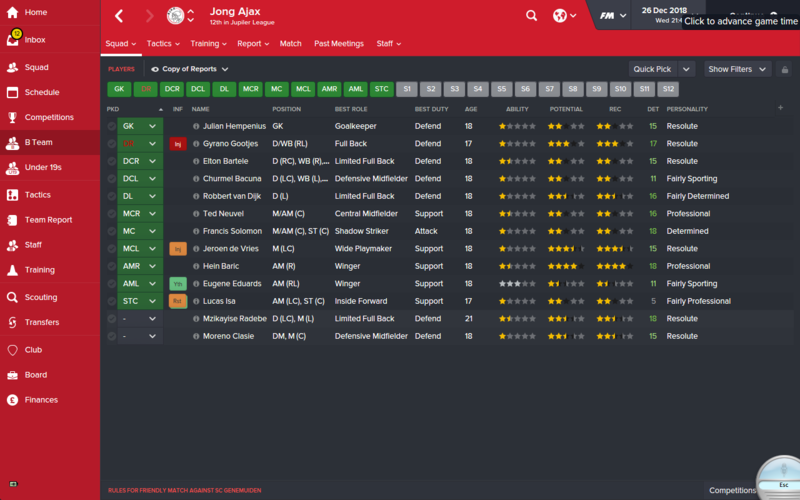 Ajax is one of my favourite saves every season. If you've not tried it yet, I highly recommend it. The squad is so flexible, tactically. You've got ball playing defenders, creative midfielders, pace-y strikers / wingers, even potential liberos. Within 2-3 seasons you could play any shape you wish. My squad was lacking inside forwards, but that could have been easily rectified in the transfer market. Got your DM & just replied - that's all fine by me, mate. A lot of people shy away from Very Fluid, and I am not quite sure why. To me, this describes exactly how the great Ajax / Barcelona teams play and it creates beautiful football. My defenders generally play short passes between each other or on into midfield, occasionally longer but the players played in the example above are more than comfortable doing that. They make lots of passes and have some of the highest % completed in my entire squad. I do emphasize and re-emphasize the importance of balance in a Very Fluid system. I recommend Standard as a mentality. Control / Attacking is more likely to encourage your defence to do something crazy, but standard just encourages them to choose the best option. True story. Great idea, great interpretation, and perfect thread. I particularly like how pressing turned out for you. Now that I've seen your Total Football 3-6-1, I have a totally different idea, mentioned in SV article - defensive 3-6-1. Really like this thread. With the two CM(s) did you look at getting them to swap? I have set my two up to swap then set each player to individual instructions for either side. This way if my attacking player and defensive player swap they keep their instructions. The rest of the tactic looks symmetrical so it made sense to me. Although there are a number of players that can lay claim to the best player ever, there's only one that can even be nominated as the most influential; Johan Cruijff. Something all these attempts at recreating a system invented 50 years ago is a testament to. 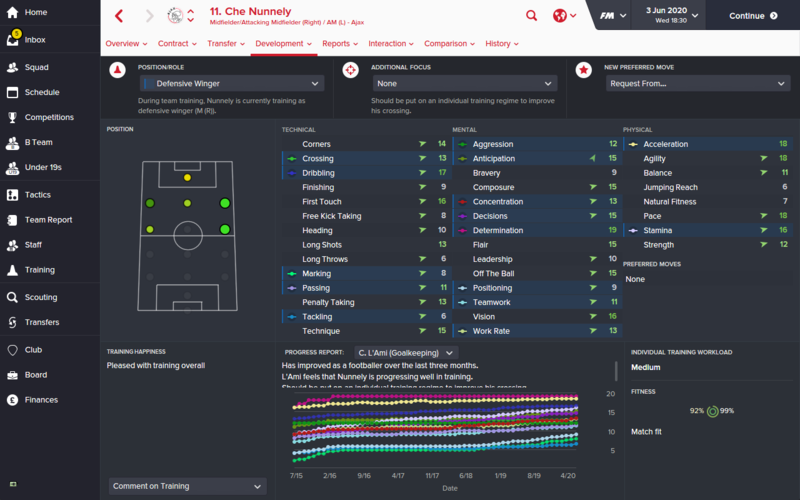 I've always had a dream of finding that one, special playmaker from the Netherlands and on FM 15 I found him. Same height, born in Amsterdam, bought from Ajax, where he came through their youth set-up. I think he'd love playing the system you've created, in just about any position. Good stuff, some of your points really made a few things click in my brain how to get my 4411 very fluid tactic working how I want. Is the SFraser article in his memorial thread? Ö-zil to the Arsenal!, definitely sightseeing reading. However I'm meticulous to some moments. You've mentioned to keep squads size as smaller as you can but you do have besides youth(11)/reserve(11)/main(22) a quite amount of leased players. Why haven't you got rid of them? In the OP you've said to train wingers as Complete Wingbacks, nonetheless Che Nunelly is being practiced to become Defensive Winger. I've been staunchly Structured for a while now, but this makes me want to dip my toes in more Fluid waters. Interesting that you combine Very Fluid with Be More Expressive, that's a lot of creativity you have going on there - and clearly paying dividends. Great read!!! Been looking round trying to find some good threads using 3 defenders and this looks like a formation that can flex to be attacking and defensive when required. I'm aware this thread isn't the tactics sharing centre, but wondered if you were planning on releasing the tactic to the community to have a play about with? My current 4411 (which I tweaked last night after you made a few things click in my brain) could work for season 1 arsenal as a transitional system towards yours. I would buy a better DLP-D and CB-D for the first season. I don't give more expression and I use Offside Trap, apart from that our TI are the same. WM-S has PIs to make him more central like your 2nd CM-S and my WB-A takes up the wide duties. It's not a big deal to replicate whole TI/PI to your save but keep in mind you have different players, another competing teams. Yea I know I can replicate it, always worried about missing something thats all. I'm looking at giving it a trial in the EPL and using existing team players and buying players in to fit the system. About that discussion about the 3-5-1-1, 3-1-4-1-1, and 3-1-5-1, I've been playing very fluid on FM16 for a while now and love it. But because of the "compactness" of it, I learned the hard way that I had to avoid formations that had too many players on the "same row". That's how I learned to avoid the 4-2-2-2. But the 4-4-2, 4-3-3, and 4-2CM-3-1 work well. Even the 4-1-2-2-1 wide works well because you don't have "player in front of player", even though you have players on every strata. With that being said, I'd avoid the 3-1-4-1-1 and go with the other 2. O-ZIL. would be good to hear your opinions on what PPMS will have positive and negative effects for each position. I occasionally used swap position between the AM->ST as both Kuijpers and Odegaard are proficient in both position. As for the midfield swap - where possible I prefer to have a right footed player on the right and a left footed player on the left so that that can use their body to shield possession from oncoming defenders from the centre. Klaassen is right footed and I trained van de Beek to be either footed. I also used Paal regularly on the left-side. That said, I'm pretty sure it's a minor issue and swapping could work perfectly well. You could even use versatile players like van de Beek, Bazoer and Ajer to have a player from defence swapping into midfield, which would be very "Total Football" indeed Perhaps that's opening a whole new can of worms! I always liked Ajer's height at the back, Bazoers athleticism and skill holding and van de Beek's technical ability in the middle. Oh, wow. What a player! Yep, 100%. He actually looks like a better version of Kuijpers - the lad I'm playing up front. Depending on his PPMs I'd put him straight into the AM or Complete Forward position to wreak havoc. Across 3 teams, that's a pretty small number of players. Consider that the First Team compete in the Eredivise, Cup, Champions League, Club World Cup, Super Cup and Cruyff Schaal. The luxury of Ajax is that the Eredivise is generally pretty easy, so you can use it to keep players fit, yet fresh for the Champions League. I rarely need to use players >1 game per week which means that during the business end of the Champions League I am facing English clubs with players conditioning ~90% whilst mine are in perfect condition - every little helps! We're also typically winning games easily so morale is high. In Jong Ajax, keep in mind that young players have already been tutored so this is a transition season into first team football. Finding available tutors for the U-19s is the challenge. Particularly with a young squad where many are U-24. Over 5 seasons I signed Drogba, Ollic, Kallstrom, Kolo Toure, Sneijder, van Persie, Cech (to name a few) as tutors. Aside from Cech and Sneijder, most made minimal contributions on the field but tutored extensively. Drogba now managed my youth team and Cech is now a goalkeeping coach. You get very good at managing your tutors available time. I typically work around the Youth Intake dates. 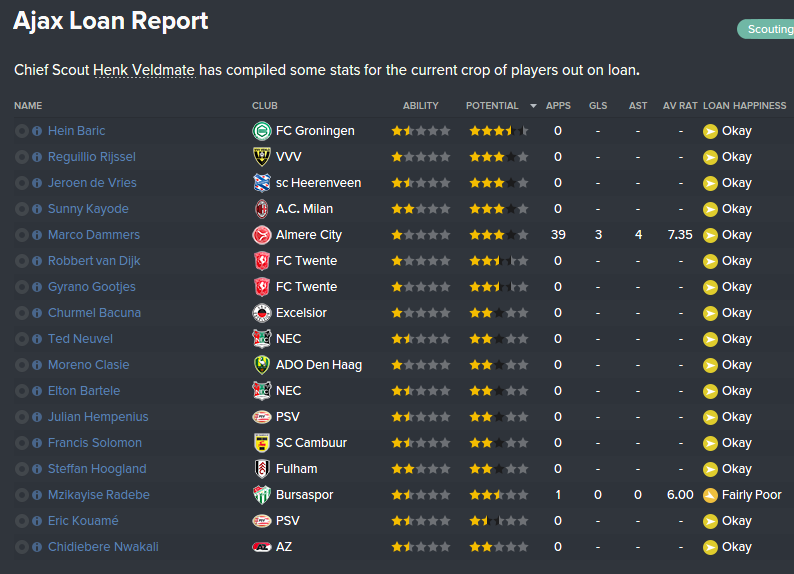 I normally take the best players from my intake and tutor them immediately (March, in Holland). Then I can have a second round of tutoring around September for those who need it, or anyone in Jong Ajax who hasn't quite got the right personality yet. It means each youngster has at least 2 opportunities to Develop the right personality. 80% of the time this is enough. In the remaining 20% - if they are rated with high potential, I'll give them a shot but if they're nothing special I will cut my loses. 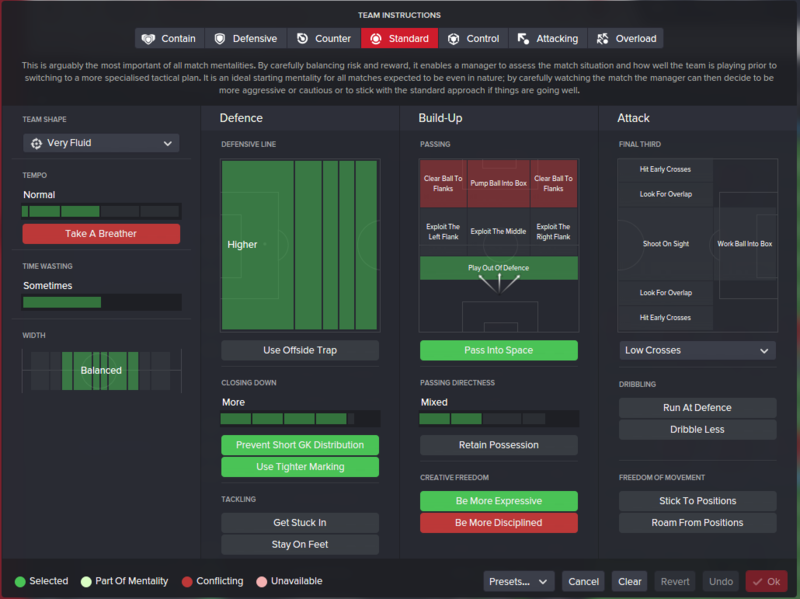 As for training, Defensive Winger is another I may use - check the training screen, it covers a pretty broad range of attributes. Box-to-Box midfielder, also. Even though I never use them (due to roaming). I'd highly recommend it. I've used Very Fluid since FM 2014 and enjoy it a lot. Think of it as - Rigid tactics you're creating a strategy, i.e telling players where to go, who to pass to, who defends, who is a playmaker, who is a goalscorer. 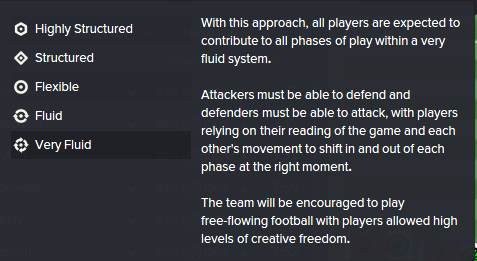 Whereas Very Fluid tactics you're creating a framework to allow the players to play. You do need a better quality of player. Afraid not. I don't like to upload a plug-and-play incase someone downloads it, tries to use it with Aston Villa and then comes around my house with a baseball bat when it doesn't work! You do have all the instructions & details there though..
Interestingly, that is exactly what I would play with Arsenal first season. Great minds think alike. I'd probably start with a flexible shape until I can get some better ball-playing defenders. Yes, I made the same observation myself. One of the advantages of the Very Fluid shape is it's compactness. When playing a DMC I observe that the defensive line drops slightly (illustrated in the tactics screen) and the midfielders take on less defensive responsibility so whilst the intention is to make a more defensive shape, you're not necessarily doing that. In this shape, the AM is a pivot and key in insuring your striker isn't isolated. Plus, you can't fit 6 players in the same band! I really like 'bands' of players. Almost all of my tactics have a MCL - MC - MCR band in midfield, using roles to create a triangle (or diamond with a 4th player). Good point. I did think of bringing up PPMs but, again, could have opened a whole new can of worms. 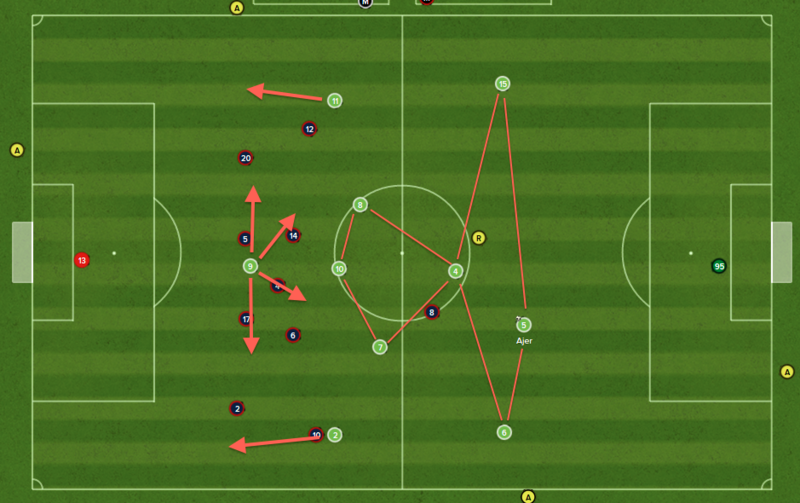 Across the entire team, everyone would benefit from Plays Simple Passes and Plays One-Twos. For Bazoer (holding midfielder) I copied Busquets with Stays Back at All Times. You can play your Complete Forward either as a classic striker or as more of a False 9, that'll largely be influenced by PPMs. You'll want movement and connecting play, so perhaps Moves into Channels and Comes Deep to get the Ball. Maybe one or two deeper players making more attacking runs. I think I had Klaassen and Odegaard both Get into Opposition Area. I thought having very fluid shape with be more expressive ti requires geniuses in squad. He's pretty much what I'd imagine Cruijff would look like on FM, atleast if he'd have even higher Anticipation. Yea that's excellent. I'd put him up top and I'd say he'll play a very similar way to Cruyff himself, or Laudrup in Cruyff's team. Regarding your TI's: Is there a reason why you don't use 'Work Ball Into Box'? I'd imagine because he is using wingers and doesn't want to restrict crossing. Dynamite thread, really like the system. I typically use work ball into box but my similar tactic i switched it off because the standard mentality ment players were more likely to play lateral/back passes and not look for the forward option as much. They also have a lot of creative freedom so can do different things more often. Yes - I just don't like it. A common complaint of possession based teams is that they try and walk the ball into the net or "possession for possession's sake", which I try to avoid. Play into space means that we're more likely to try a through ball but the occasional shot won't hurt. A couple of season's earlier - when Sneijder was in the side - it was actually a very effective method of breaking down sides who sit deep. like so many of the other comments this is my favourite thread. how do you have the team training? ballcontroll for whole year or something lie that? No, in general we're pretty solid defensively. Here's a screenshot showing where we're conceding. According to this I concede more from through balls than from crosses. That makes sense. We're a high line and our defenders are quick but there will be lots of quicker strikers to expose them. That'd explain the trouble Anthony Martial gave me vs Man Utd. 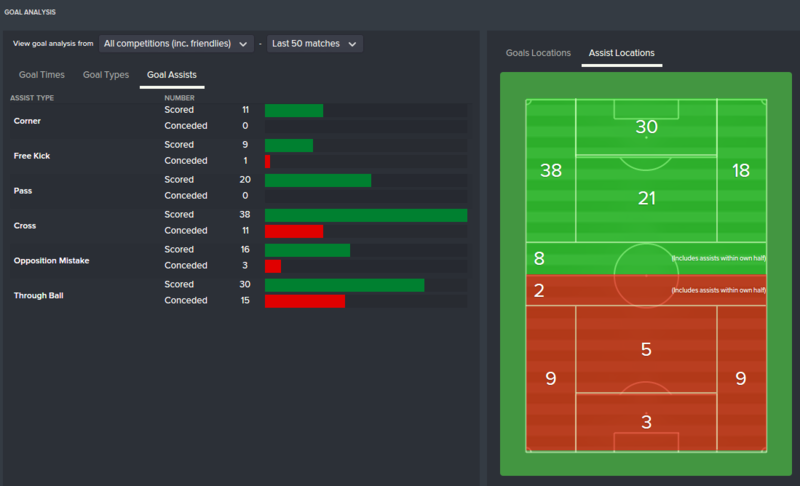 Regardless, this shows we concede around 0.5 goals per game which, whilst scoring 2.48, I can handle. These games would cover the business end of the Champions League as well. I rarely touch opposition instructions. Team training will only help when developing players, so if you have players with low or average ball control attributes, which are first touch, dribbling etc. then yes use ball control training. I tend to leave on balanced which helps develop players overall.. Pep's Bayern (when playing 3 defenders) have one of the centre backs able to come forward into midfield which stops this issue, I experimented with a libero to ameliorate the problem but I didn't ever manage to sort it out. Hoping for something like a "box to box centre back" in the next iteration of the game! Just wanted to say thanks. What started out as a great read has actually turned my hardest save to date around. I took over Plymouth Argyle in the English League 2 with an idea to do a youth development save. Firstly the Club is up against it finance wise. The squad is small and thin when you start the game. And you're desperately thin on depth at several positions. The tactic works great with some minor tweaks. Even with a much lower quality of player than you have at Ajax. Obviously Pi's make a huge difference with this type of tactic. People should probably bear that in mind as they adapt it to their squad. I guess the thing it opened my eye to was getting my center halves more involved in our attacks. I've always been apprehensive about a 3 man defense and this style of play is proving me dead wrong. I am winning the league now, but not because I am pouring goals in for fun. It's how tight my defense is that's winning me games. Lot's of 1-0 and 2-0 games. The biggest thing I took away from you're OP was the training and what to look for in players. It's changed my save around. Thanks. Good question, & bdixon is right. Youth team trains ball control + individual training. First team trains team cohesion + individual training. Individual focus on stamina, strength or quickness for those who require it. Work rate is a key attribute. It does increase slightly over time but never much. If a youngster has good (good for me = 16+ in midfield, 14+ everywhere else) work rate, thats a very strong advantage. What team structure were you using? 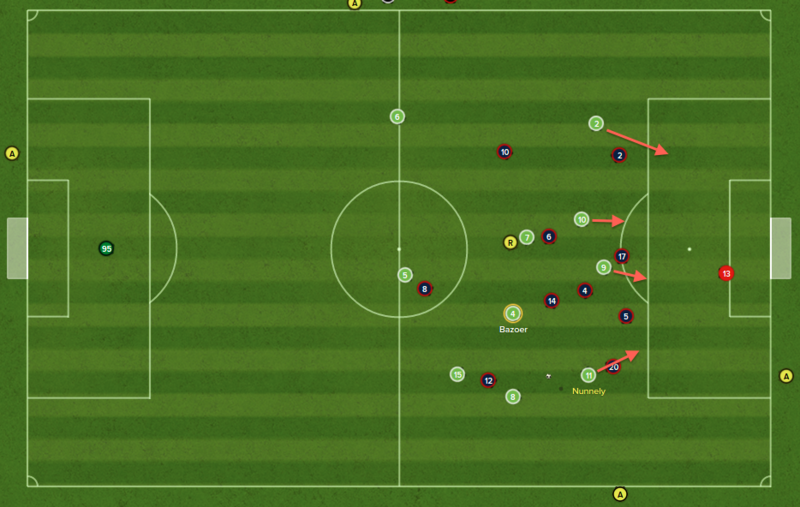 In a very fluid structure my back 3 fans out, covering the width of the field when we have possession. They're a fantastic passing option in the transition as they're in acres of space, they have 3-4 passing options ahead of them and it creates huge gaps in the opposition midfield when they press. This screenshot - from the Champions League final - is a good illustration. Riedewald is in possession of the ball. He has the technical ability of a decent midfielder. PSG can either press him or stand off. If they press, any player they bring forward will leave a man open for an easy pass. If they stand off, Riedewald is comfortable enough on the ball to advance to the half-way line and build from there. To me, the main strength of a back 3 is the options it offers in possession vs a back 4. Loving this thread. Inspiring read, and I know it took some time to put it all together, so thanks for your work. Just passing by to say what an amazing work you've done. Excellent read as well together with your other threads. Makes me want to start a new save and pick a team to replicate. Maybe one of Mourinho or so. Yes, it's actually a pretty fun way to play. With a lot of famous teams the challenge is actually identifying and devloping the right players, more so than creating the tactic! Great thread. Been traveling for the past 8 months, going home soon and can't wait to try this! Ozil... in the Spilverlagerung article on the 92 game v Sampdoria it mentions the False 9 movement of Laudrup - with Stoichkov moving like an Inside Forward and Juan Carlos moving to the flank. Do you have any thoughts on re-creating this movement in FM? The way I see it it's impossible but interested to hear your views on it. I have something similar to this running, but I've also used the same base as this and re-hashed the roles and have something similar to the way Turkey played in the 2002 World Cup - fantastic football. I really hope that for FM17 we have an Attacking Centre Back role - as has been mentioned elsewhere on this thread, the 3 at back is too inflexible when against a lone striker or on attack - would be nice to have one step up into midfield a-la Alaba. You're right though, the passing options from the back 3 when looking to dominate possession are superb. Have you read any articles on Ricardo La Volpe and Salida Lavolpiana? Between your tactic in the OP and La Volpe, this is how I like to play (out of defence). I don't have much to add that hasn't already been said really. Awesome thread! 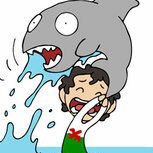 it's stuff like this that really captures the imagination as an FMer.